When you’re a man alone in the house and your family is away for nearly two months, the stuffed animals really stand out. The silence is there too, awkward and deafening, but I expected that. It is the pink elephant, snuggly rabbits and teddy bears looking out from behind every corner that strike deepest. Stuffed animals are cute when accompanied by small children, but downright disturbing when abandoned. This fall has been a different one for the family. My wife Cathlin is on a four-month sabbatical from the church, and she received a grant from the Louisville Institute to spend it in Scotland. She lived there for a month by herself in September and then I visited with the kids for two weeks in October. When I returned to the Vineyard for work the kids stayed. While waiting for my flight home in the Glasgow airport, I passed a toy store with a man out front dressed up as a giant green dog. He was goofing around with some kids, enticing them with bubble machines and other knickknacks sold in the store. By reflex I began walking toward him; it is what you do when you have small children, be transfixed by six-foot talking dogs who wear white gloves and can do magic tricks. But then I remembered I was a man alone, not a father being tugged forward by his little girl. There were probably laws against single men cheering on giant dog magicians surrounded by small kids. I quickly walked away before any of the parents noticed me. Back home on the Island, I soon realize that not only are my children missing but the whole routine of my life has been mostly erased. I don’t go to school drop-offs and so don’t see my circle of parents or my children’s friends. I don’t go to story hour at the library, ballet class or tennis lessons. I’d be lying if I didn’t say a lot of this was enjoyable, not spending hours each day organizing play dates or surviving harried mornings making school lunches. But I grow uneasy when I also notice that I no longer have my full range of emotions either. Although I never realized it, before children I had lived life in the middle ground of emotions, never fully venturing out to the extremes. I never had a temper, not really, until I encountered my son having a full-blown tantrum about which socks to wear. I never felt true contentment until I sat between my son and daughter reading them books I had loved as a child. And I didn’t know how deep exhaustion or love could be. While alone, I feel myself returning to that smaller playing field of emotions. And yet, at the same time, without the moment-to-moment scrum of parental survival, it is almost as if I can see and love my children more clearly. I find this disconcerting. Could I really be a better father in absentia? I don’t know about you, But I’m feeling 22, Everything will be all right, If you keep me next to you. For a moment it feels as if both my children are riding with me, Pickle adding harmony from the backseat and Hardy complaining about the choice of music. But as I belt out the chorus, I realize I have arrived at a stop sign in town. The car windows are down and my voice carries to a small crowd of tourists who look at me and laugh. I try to maintain my dignity by smiling and waving. It doesn’t work, so I raise the windows and drive off with a screech of tires. On the way home I switch to Bruce Springsteen’s You’re Missing, another one of Pickle’s favorites. But that song is from The Rising, the album Bruce made in the aftermath of 9/11. It is a good song, but a deeply sad one about a husband and father who will not be coming home ever again. The song is too much for me and I turn it off, preferring the silence, while also wondering why my eight-year-old girl enjoys it so much. I try to shake the mood of the song but it stays with me, and back at home I am reminded of saying goodbye to my children at the airport in Glasgow. After boarding my flight, I settled into my seat, buckled my seat belt, and prepared for my pre-flight routine. Before children I would have opened a book, looked to the movie listings or settled in for a nap. Back then I wasn’t afraid of flying. But having children changed this. Now when I buckle up I think of all that I have to lose, or rather what my children have to lose if I die. During takeoffs and landings I now pay attention, sitting up straight, feeling the acceleration of the plane down the runway, absorbing every bump on the tarmac and nudge by the wind. If anything happens I want to be present and thinking about my family. Once I am in the air I return to being a normal person, asking for a drink and watching violent or trashy movies. Somehow I feel safer high in the sky than at points of contact. The next day I go for another drive, this time just as dusk begins to settle. I look up in the sky and see the first few stars coming into view. 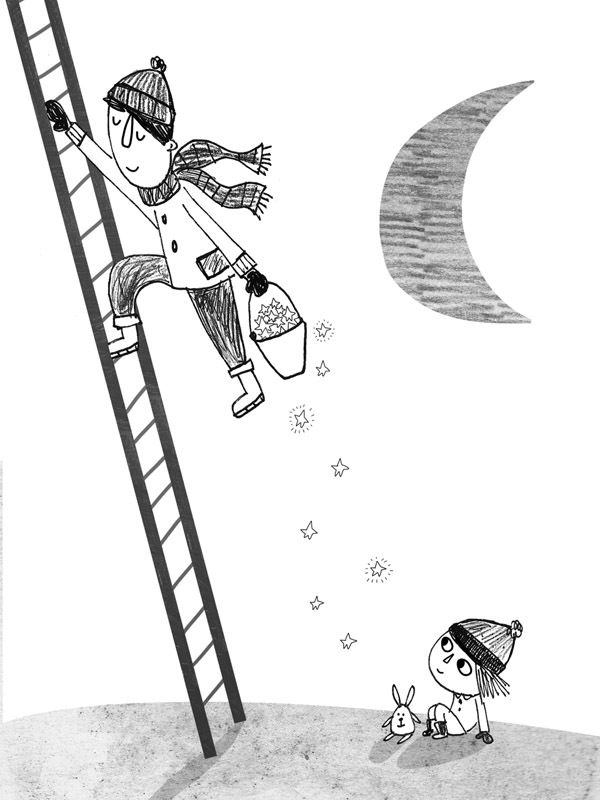 When Pickle was very young she decided that I was the one who put the stars up in the sky each evening, climbing a very tall ladder and working deep into the night. When I put her to bed she would quiz me about this task, asking how I got the job (a wood troll gave it to me as both a curse and a blessing), what was the hardest part (the top of the Big Dipper) and whether I ever needed any help. Pickle decided that Calder, her friend Maeve’s dad, took over the duties when I was sick or we were traveling. When I said goodbye to Pickle in Scotland she brought this up again, even though at age eight I am sure she doesn’t truly believe it anymore. While crying and hugging me, she reminded me of my job in the night sky. She also suggested because I might be lonely that I give Calder a call. We could put up the stars together, she offered, and maybe add a few extra as we would have more time working as a team. Pickle has never informed Calder that he is the relief star dad, and I have never found the right moment to let him know either. But he is usually game for anything, even though at the moment he is building a house for his family. And so instead of returning to my quiet, lonely house I head over to his place. That was a few days ago, but as of this writing we are still up there each night, two dads standing tall on precarious ladders, trying so hard to be the guiding lights our children want us to be. Another beautiful piece of writing! No matter how old your kids are, you always feel that sense of responsibility mixed with a sprinkle of the stardust of love. And then it extends to your grandchildren. Outstanding! In capturing and expressing your own reflections, you have also helped others focus on the inner experiences we share as we treasure those whom we nurture. Billy you are the best. I love the closing metaphor. Can I help you and Calder place the stars in the night sky sometime? Can we have a few cold beers afterward and talk about our children? Stunning, Bill. And loved when you all came to visit!! What a beautiful, moving tribute to fatherhood. I would love to see the story about Dad placing stars in the sky, in a children's book. If you haven't written it yet, I hope you do so soon. A magnificent ode to fatherhood, and to the loves and tribulations one incurs from the presence (and absence) of children. Beautiful writing! We miss you all. Loved it. I think the Gazette should give you a sabbatical. A whole book of these pieces wouldn't be enough. Beautifully written! Miss you and the Gazette every day! Old Irish Proverb (slightly altered): Three things a man must never be without--a cat, a chimney, and a good story for his children. Good stuff Bill Eville. Maybe my favorite to date. If you ever need a hand with some of those Northwest stars give me a gingle.